The average age of a business owner in New Zealand is said to be 58 years. As baby boomer business owners reach retirement age there is likely to be a huge influx of business owners looking for ways to transition from their businesses. Selling a business is complicated and it is not something to rush into. Buyers generally purchase a business based on its historical performance, so if you decide to sell today your business will be evaluated on how you have performed in the last few years. In order to maximise the return you get from your business's sale it’s important that you take the time to prepare your business for sale. Property Brokers specialise in adding value to business owners through the exit planning and business sale process. We have comprehensive experience, tools and resources available to assist owners preparing their business for sale. We look for opportunities that could improve the sale price and help you identify the best way to exit your business. Your business is likely to be one of your most significant assets. Entrust a specialist to preserve your wealth and get the result you want. We provide you with a quick questionnaire to give you an indication as to how saleable your business is right now and what you could do to improve things further. Property Brokers provide you with a report detailing our findings from the above assessment and our own research. We compare your business to your industry and report back in plain terms letting you know how you are doing and areas where you could improve. 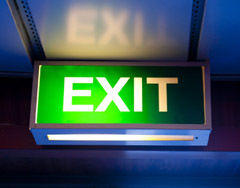 We assist you in implementing your personalised exit strategy plan. We appraise your business and then prepare information packs and marketing material. We can then market your business to the market and our databases. We manage the sales process and handle all negotiations.